Onderstaand artikel is geschreven in opdracht van de Italiaanse korenbond FENIARCO voor hun blad Choraliter. Vocal music has always been there. Its development went through ages of history from (before) the Middle Ages, when more polyphonic ways of performing were developing from the Gregorian chant, to the Renaissance and onto all the periods in the western music. Other people know more about those eras than me, I know that for sure! That’s why I want to start at the point where the pop & jazz music starts to develop. Nowadays there are so many ‘flavours’ of vocal groups and vocal music in pop & jazz, but where does it all come from? It wasn’t until around 1900’s that Scott Joplin came around the scene of Ragtime. There was no singing whatsoever, but it was the start to all the ‘ragged’ music with its very important ingredient: heavy syncopation. When we go further into time, into the 20’s and 30’s, we can find some groups who were very important for how the vocal music was developing to where we are now. Two groups are popping up in my head. 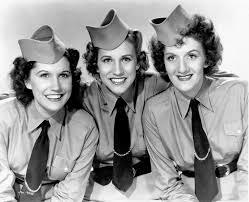 The first group is the famous Andrew Sisters. Three ladies singing mostly homophonically and using easy harmonic structures in their music. The melody would always be the middle voice. Then there was a part on top of that melody. The third part was always below the melody. The second vocal group is the less famous of the two: The Ink Spots. Four guys singing in harmony, with one lead tenor who sings the melody. They performed with accompaniment, mostly with guitar, and a lot of songs are in the ‘Jive’ style. Just look for them on YouTube and you know what I mean by that. 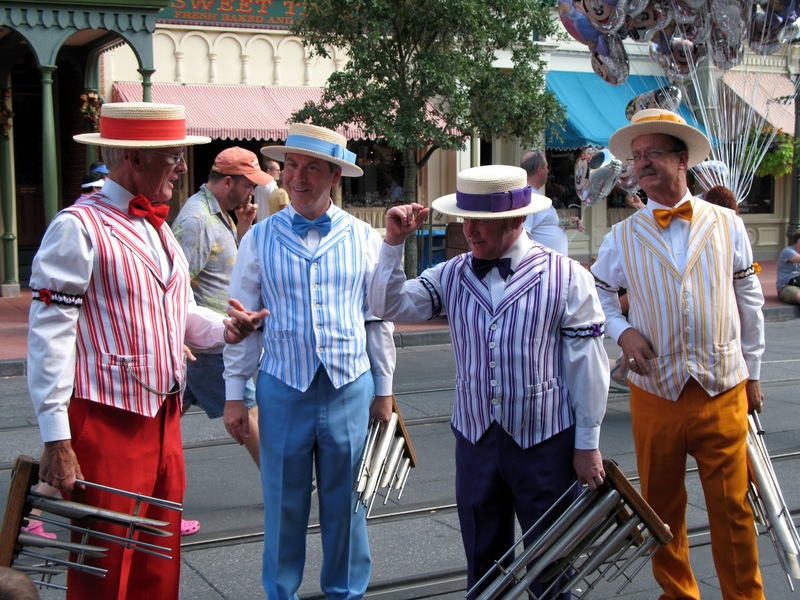 The 1940’s are referred to the barbershop revival era (1940’s – present). Barbershop has a very unique sound what comes from the style of arranging. Arrangements in this particular style are written for four male voices (or four female voices, mixed groups are rare). The melody is sung by the Lead. The tenor is singing a part above the lead and the bass will sing the lowest notes. Under the lead there is the baritone who is completing the chords. There are a lot of famous songs and you can occasionally find a big group of barbershop singers singing in the afterglow of a concert. No matter if you’re from another group, you just join in and sing along! The Barbershop style is bound to strict rules which can be found on several websites of associations. Just Google and you will find them easily. This style is a style of a vocal-based rhythm and blues music developed in African American communities in the 1940’s, but became popular in the 1950’s and early 1960’s. As a musical genre, doo-wop features vocal group harmony with the musical qualities of many vocal parts, nonsense syllables, a simple beat, sometimes little or no instrumentation, and simple music and lyrics. To hear some good examples in this style you can listen to Randy & The Rainbows (“Denise”), The Crows (“Gee”) and The Jaguars (“Thinking Of You”). You will hear a lead vocalist and multiple backing vocals. In this era there was also a group formed called The Hi-Lo’s. They performed more vocal jazz repertoire, often accompanied by a big band but they did some really nice a cappella arrangements. The arrangements were written by the mostly talented Gene Puerling. Please remember this name, because he was a very important man to arranging for vocal jazz music. In 1959 in Paris Mimi Perrin founded a group called ‘Les Double Six’. The group began as session singers mainly doing background vocals for singers such as Charles Aznavour and Edith Piaf. The eight session singers sang through Bach‘s Well-Tempered Klavier as a sight-reading exercise and found the music to have a natural swing. They recorded their first album Jazz Sébastien Bach as a present for friends and relatives. Many radio stations picked it up and this led to the group recording more albums and winning a total of five Grammy Awards. The group was not long-lasting. Because of Perrin’s health problems, Les Double Six dissolved in 1966. 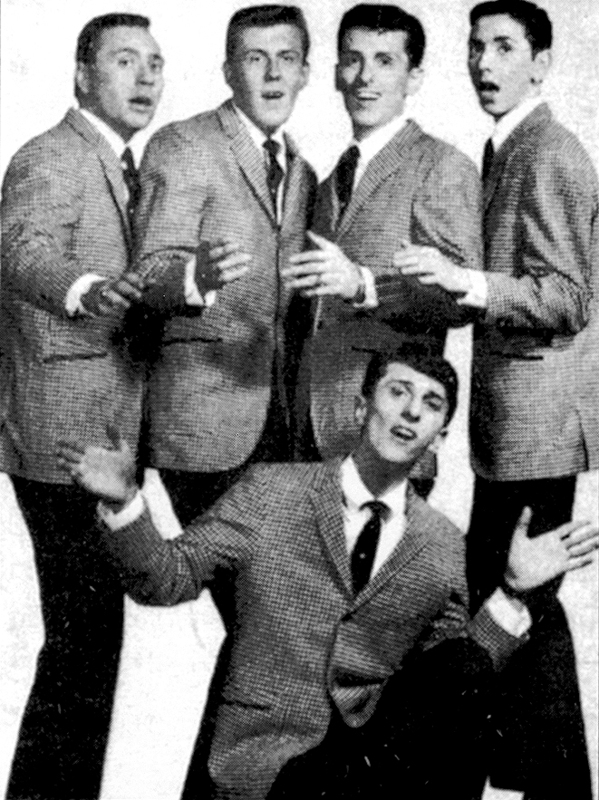 One of the eight singers of the original Les Double Six was Ward Swingle. In Paris In 1962 he started his own group called The Swingle Singers, also cosisting of eight singers. In the beginning they started to reproduce the works of Bach in the vocal jazz style. Many of the singers of ‘Les Double Six were singers in The Swingle Singers. In 1973, this group was disbanded and Ward Swingle moved to London and recruited all new members who debuted as Swingle II. The group later performed and recorded under the name The Swingles and then, The New Swingle Singers and eventually, simply, The Swingle Singers. Since the London group’s incarnation, the group has never disbanded. As individual members have left the group, the remaining members have held auditions for replacements. The group has a typical sound and you will recognize them within a second if you have ever heard them. Where the French group performed and recorded typically with only a double bass and drums as accompaniment, the current group performs and records purely a cappella. Until today they are doing some remarkable stuff and since two years they organize their own festival in London every January. In the 1971 there was something else happening in the vocal world. In that year Gene Puerling, I told you to remember him, formed a group called The Singers Unlimited. 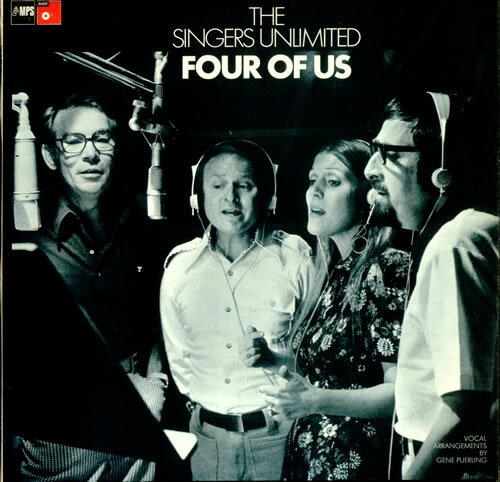 The Singers Unlimited were originally formed to record for commercials in the USA, but as time passed, they were persuaded to enter the recording studio to record a series of albums. The group produced 15 albums, of which arguably the most well-known is their Christmas album. All of the 14 albums they recorded, between the years 1971-1982, are collected in the 7-CD box set entitled Magic Voices. If you can, please order this CD box set! 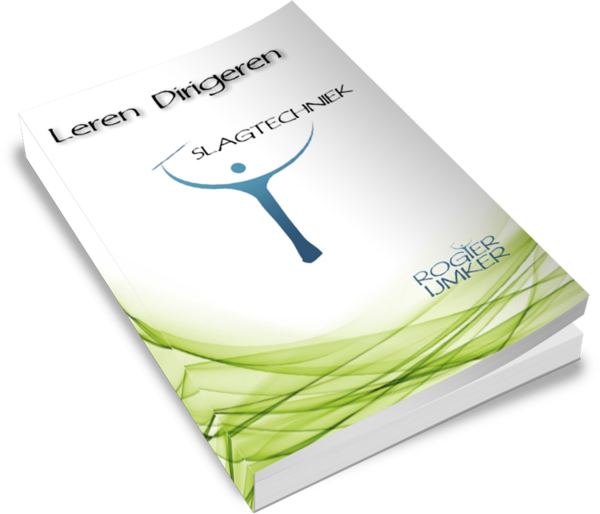 It is worth the money and gives you a big piece of the vocal history puzzle! You will love it! Puerling’s Singers Unlimited arrangements earned him the reputation as one of the best vocal writers in the world. 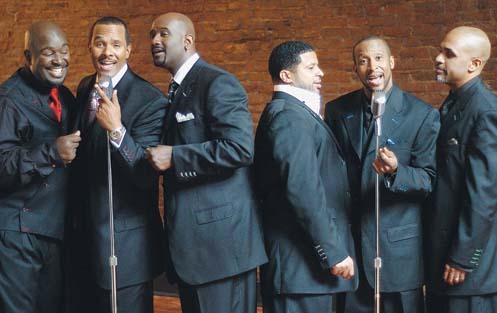 Members of the renowned jazz-gospel vocal group Take 6 often give credit to Puerling and the Singers Unlimited as innovators in the a cappella world, claiming that they “went to school” on Puerling’s arrangements. Puerling took advantage of cutting-edge multitracking techniques of German studio engineer Hans Georg Brunner-Schwer to create his advanced harmonic concepts and the group’s signature sound. In the overdubbing process, baritone Puerling and tenor Shelton would often add two additional middle parts, after which all parts were “doubled” and “tripled.” Creating these extra tracks created the fuller, richer sound of the group’s recordings, and is now a common recording practice. When we talk about the 1980’s there’s a group coming up in mind, called The Nylons. This group was founded in 1978 in Toronto, Canada. Their sound was typical for the 1980’s: electronic clean sounds. And please excuse me for my opinion, but it wasn’t really innovating, but more kind of boring. But hey, that’s my opinion and taste. If you like it, there’s no way I could judge. In 1980 there was also a group starting up in the U.S. Started on a Seventh-day Adventist university in Huntsville, Alabama, they integrated R&B and jazz in their music. They started under the name Alliance but after they got a contract in 1987, they changed the group’s name into Take 6 because the name ‘Alliance’ was already used. The sound of Take 6 is undeniably recognizable. The six men singing so incredibly close in smooth jazzy harmonies with a timing which is just superb. In some of their songs you can hear the religious background of the group members. Songs like ‘If You Ever Needed The Lord Before’, ‘Get Away, Jordan’ and ‘Mary, Don’t You Weep’ are based on the gospel style. Just to get an idea of how they build their harmonics you have to watch this video on YouTube. You will see how they build it up. It’s very fun to see and hear. From the 1980’s until now there is a big, big gap, I know. But what I want to tell you about, is a little bit difficult to divide into decades. So, that’s why. I went to the Conservatory in the year 2000 and my interest for vocal music was growing. Internet was booming and services like Napster were growing too. By accident I downloaded some songs of an unknown group. Later on I learned that this group was called The Real Group. This was my very first introduction to a cappella music in a way I never heard before. I also never would have thought that it was this group was my introduction to many, many other groups and would be my source of inspiration for many years until this very day. The harmonies and dynamics in their arrangements are so cool! In the start of their career they primarily were singing jazz standards (that’s where the name of the group comes from). Later on Anders Edenroth, the group’s tenor, started to write songs himself and also other group members started to write their own songs. Some of the songs are very surprising and they range from jazz to pop to Nordic folk music, but primarily jazz and pop. It was not until 2008 that I had the chance to go to Sweden and meet the members of this group on their very own festival, organized for the first time. And it was great! On the website of this festival I read that there would be a choir of 30 members singing on one of the concerts of this festival. I went online and before I knew it, I ordered all of their cd’s! It was Vocal Line from Denmark. This group was phenomenal! Not ever I heard such a large group singing music in a way that was so natural and groovy. The arrangements containing such a wide and big sound, it was incredible. That’s what I wanted to do too and the idea of my own choir was born, following their example! You will probably get a hang on what I’m going to with this article. In my opinion nowadays the vocal magic is happening in the Nordic countries of Europe. 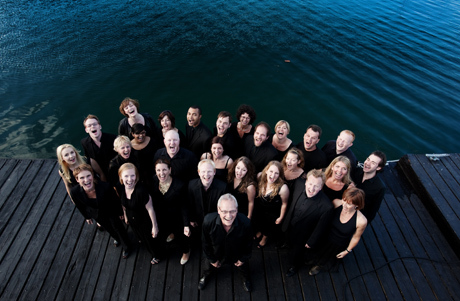 Other groups like Pust, singing repertoire of their own music and interpretations of traditional songs from Scandinavian countries in new arrangements inspired by jazz, ethnic music and folk music, and of course Rajaton from Finland, who are everything from classical music to ABBA (‘Rajaton’ means ‘Boundless’ in Finnish which indicate the breadth of their repertoire). The very new sensation nowadays is the Danish group ‘Postyr Project’. They use electronics in a way that they control all of the effects live on stage. Their technician is only there for the balance between the voices. Everything else they are performing live on stage, even if it looks like it’s impossible, they are doing it! I know that I am not complete in this article. Of course there are even more groups important for the development of vocal music as it is today, but my intention was to give you a list of group names who were very important for this development. Every group has inspired me and made me who I am today, artistically and as a human. Hopefully this article will inspire you to look further into groups and music and get your blood pumping for the Vocal Pop & Jazz!